The YWCA is a membership movement of women and girls age 12 and older. Girls over the age of 15 and women have voting privileges. Participation in and support of YWCA Princeton programs and activities brings with it membership in the YWCA Princeton (extending to all Greater Mercer County communities), YWCA USA and the World YWCA, equal partners with a common purpose. Attendance at Annual Meetings is not a requirement of membership, but members are encouraged to attend. One percent (1%) of voting members constitutes a quorum. Please join us on May 7, 2019, from 5:00 to 6:30 pm. After the Annual Meeting, everyone is invited to stay for the Volunteer Appreciation Party. 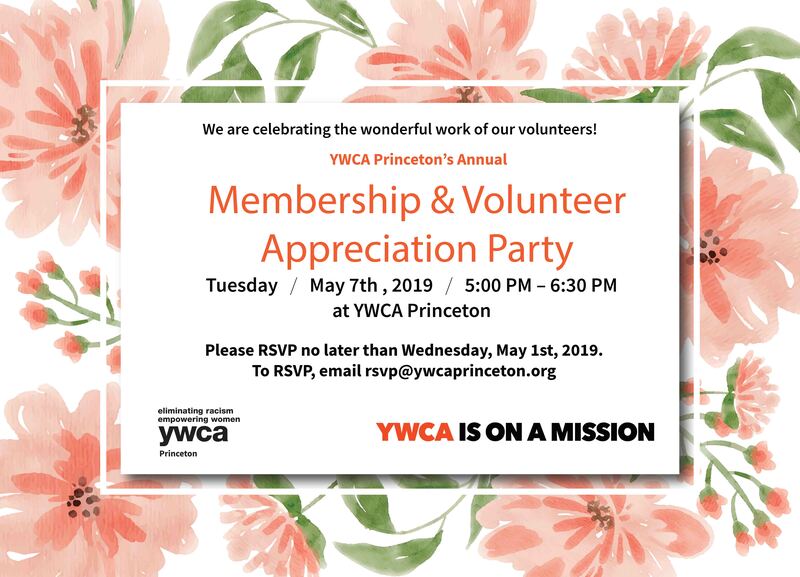 Enjoy an informal evening, as we honor the hard work of our dedicated YWCA Princeton volunteers. This event is to welcome and introduce the new Board members to the general membership and to thank all of our volunteers for their service. Please RSVP at rsvp@ywcaprinceton.org. And we need your help to achieve it.